Chandigarh, November 16, 2014. 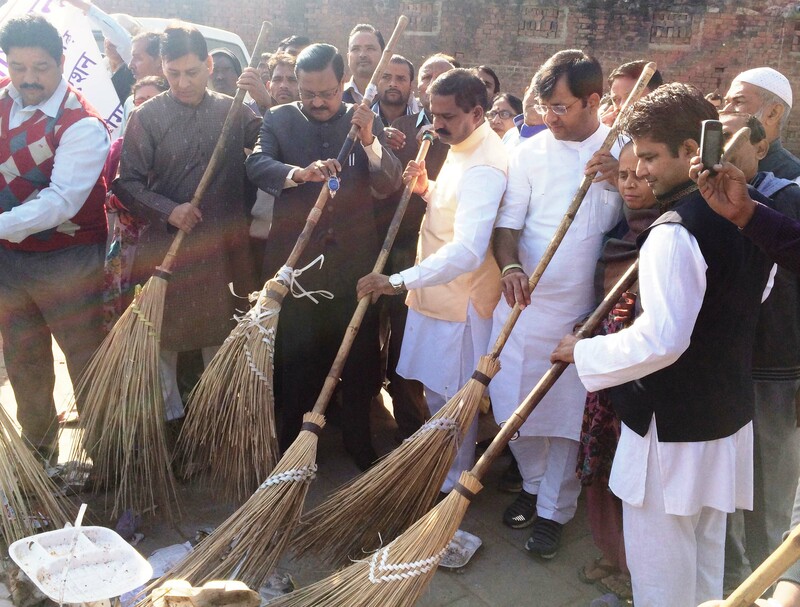 Mr. Satya Pal Jain, Ex-City MP has said that the ‘Swachh Bharat Abhiyan’ launched by Prime Minister Sh. Narendra Modi has culminated into cleanliness becoming a habit of every citizen of India, which will make India really a neat and clean India. Sh. Jain today led a cleanliness drive in Daddu Majra Colony organized by the Sh. Narinder Choudhary, President of Dalit Raksha Dal, Chandigarh & Daddu Majra Welfare Association. They cleaned various roads and streets of the colony. Sh. Choudhary said that he and his association would take this campaign to each and every house in the colony. Addressing the gathering Sh. Jain said the ‘Swachh Bharat Abhiyan’ will make the life of every citizen more comfortable. Sh. Davesh Moudgil, Deputy Mayor of Chandigarh said that the ‘Swatch Bharat Abhiyan’ launched by the Prime Minister Sh. Narendra Modi has started showing the results, as the people are now feeling more concerned about cleanliness. Among others Sarav Sh. Rajender Kumar, Sh. Subhash Sood, Sh. Dharmender Kumar, Sh. Sanjay Chawla, Sh. Ajay Kumar, Sh. Ram Milan, Sh. Gaada, Sh. Surinder Singh, Sh. Kesar Singh, Smt. Meera Devi, Smt. Swarna Devi, Smt. Veena Devi, Smt. Kelasho Devi, Sh. Mukesh Kumar, Sh. Tarsem Rana, Sh. Devi Ram Aggarwal, Sh. Sanjay Mittal and Sh. Rajender Jain were also joined Sh. Jain in this campaign.